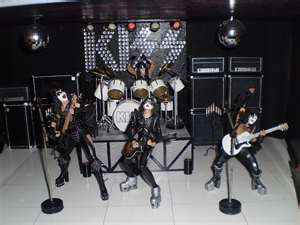 It has been said that KISS went disco with this album and use the hit single from it “I Was Made For Loving You” as the argument to support it. In some circles, in regards to the song, that may be true but I have a younger sister who was heavily into disco at the time. Therefore, I avoided going near her bedroom so I wouldn’t get my ears desecrated by “I Will Survive” by Gloria Gaynor or anything the Bee Gees were doing at the time. I would take the KISS song over those every time. If my sister should read this, she will probably kill me for mentioning these embarrassing days of her youth. She did see the light a year or so later. The disco consideration was not the reason I didn’t listen to the album back then and it wasn’t even boot camp either. Back in that time, I was still allowing my mind to be messed up by religion and I actually believed the crap that KISS stood for Knights In Satan’s Service and they were all admitted Satan worshipers. Thinking back to that time, I can’t believe I was that naive. The problem was that back in my teenage years in the 70s, I was a born again Christian, a Jesus freak if you like. I won’t go into details on it but I will say that as a teenager, religion messed my head up more than drugs or music ever could. Anyway, to the “Dynasty” album. Having listened to it again, I didn’t feel the need to sacrifice a goat to the Dark Lord, well maybe a couple of chickens. Still even with the disco song included, it’s not that bad of an album. In fact, maybe there is an argument for removing “I Was Made For Loving You” from it because the rest of the album is pretty good. Like I said with Triumph, back then, metal was still in its early stages and many acts were still experimenting with their sound. So, I’ll give KISS the benefit of the doubt on this one. Besides, I especially love the last four tracks and “Magic Touch” and “X-Ray Eyes” stand out for me in particular. All of those final songs remind me that KISS are capable of putting out some great rock. One thing KISS could still pride themselves back then was the fact that all four members took a turn at the lead vocals, not something most bands do. The Beatles and The Eagles were the only ones that come to mind at the moment. For KISS, they still continue to do that very well on the “Dynasty” album and there is something cool about hearing the different vocalists on it. That is why I this album probably deserves more credit than what it has been given. This entry was posted on February 26, 2013 at 9:00 pm and is filed under 1979, Heavy Metal, Music, Rock, Uncategorized with tags Classic Rock, Dynasty, hard rock, Heavy Metal, Heavy Rock, KISS, The 1970s, Triumph. You can follow any responses to this entry through the RSS 2.0 feed. You can leave a response, or trackback from your own site. Cool post. I was wondering when you’d get round to this one. I love this album… even the first track! For all it’s reputation as a “Disco” album, there’s a lot of Ace on this one. He got a lot of great songs on this and he can always be relied on for quality riffs. And Paul’s “Magic Touch” and “Sure Know Something” are solid KISS classics too. There is a good bit of Ace, I do like the song 2,000 Man so I don’t know why they call it a disco album. Glad no chickens were harmed. p.s. Funny thing is that I found myself humming that disco tune all day today, go figure. Not that bad, you’re right. In fact any weakness here could probably boil down to production. If someone like, say, Eddie Kramer produced these very same songs, it might have been another Rock and Roll Over. Who knows? But it’s not bad and I still play it. Good on you for still playing it. Production does have a lot to do with it so who knows? Maybe Kiss will line this up as their next album to remix! If there is money to be made, I guarantee Gene has thought of it. 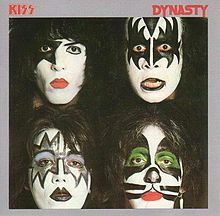 Dynasty has two of my all-time favourite Kiss tracks ever. “Dirty Livin” and “Save Your Love.” I’d love if the band played “Save Your Love” live. I wish more bands would cover it.